Allow me to share one of my many Daegu (South Korea) walk-about joys. I often spend hours just walking around Daegu, and at times come across some interesting pictures. 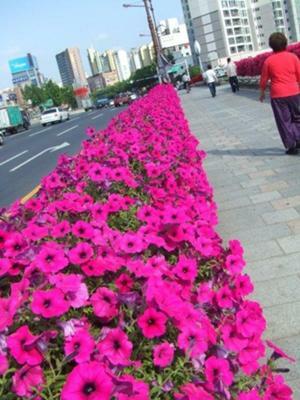 During one of my excursions, I was delighted to look up and see a garden of petunias. Not in a field, or in a yard, but along a bridge. Although the roadway was chaotic with speeding traffic, the walk across amidst the blooming petunias was peaceful and enchanting. It only goes to prove that tranquil beauty can be found amidst chaos. Glenys' Reply Great photos Rozanne! 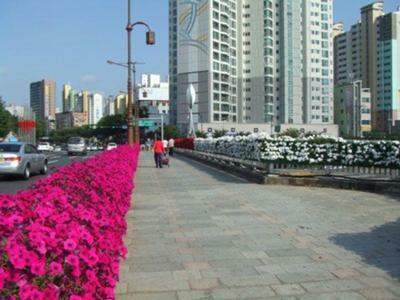 I love the solid pink petunia bridge. Also the way you slanted the first photo. I don't remember seeing the solid colors of planters on any of the bridges when I was there, but this sure spices the city up. These photos make me a bit "homesick" for Korea! Spring is a really flowery, lovely time there. Thanks so much for the submission. Hi Carol, thank you for the comments. What a great idea to pass the pictures on. Al along the side walk too. I would love to show this to our local council maybe it would give them some ideas.